This image shows the reaction mechanism for oxygen reduction on nitrogen-doped graphite. 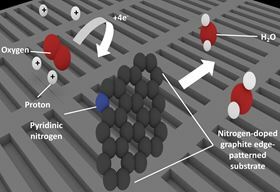 Researchers from the University of Tsukuba in Japan have solved a persistent mystery surrounding the structure of the nitrogen-doped carbon catalysts that show great promise for use in fuel cells. Constructing and testing a number of model catalysts allowed the researchers to determine that the active sites on these catalysts occur where carbon atoms are attached to what are known as pyridinic nitrogens. This discovery will open the door for optimization studies looking to enhance the performance of this catalyst. The oxygen reduction reaction is a key step in the generation of electricity by fuel cells, but depends on expensive precious metal-based catalysts. Carbon-based catalysts with added nitrogen are among the most promising alternatives to precious metals, and could allow more widespread use of fuel cell technology. However, until now, the precise arrangement of nitrogen and carbon atoms that give rise to this catalytic effect remained a mystery, stalling efforts to develop more effective materials. In an article published in Science, a team of researchers from the University of Tsukuba have now identified the catalytic structure and proposed a mechanism by which the reaction works. “We knew that nitrogen-doped carbon was a good oxygen reduction catalyst, but no one was sure whether the nitrogen was pyridinic or graphitic,” said corresponding author Junji Nakamura. Pyridinic and graphitic nitrogen describe different bonding configurations between nitrogen and carbon atoms in nitrogen-doped carbon. To solve the mystery, the team fabricated four model catalyst substrates, simulating different potential structures, and analyzed their catalytic activity. Pyridinic nitrogen, in which a nitrogen atom bonds with two carbon atoms, occurs mainly at the edges of the material. By patterning the substrates to change the number of edges, the team could control the presence of pyridinic nitrogen and measure how it affected the catalytic activity. Their results showed that the active catalytic sites were associated with pyridinic nitrogen. This story is adapted from material from the University of Tsukuba, with editorial changes made by Materials Today. The views expressed in this article do not necessarily represent those of Elsevier. Link to original source.